The diagram below illustrates the basic layout for a 4 Agent by 8 line SpitFire Predictive Dialer. This configuration is using analog phone lines and it is not integrated into a phone system or PBX. This next image is the basic wiring diagram for the Dialogic card cables in the back of the Dialer. This card is what provides voice connectivity to the individual Agent station headsets. This card can go up to 8 stations. This card provides up to 16 lines of outbound dialing capacity. It requires standard, analog or POTS lines. 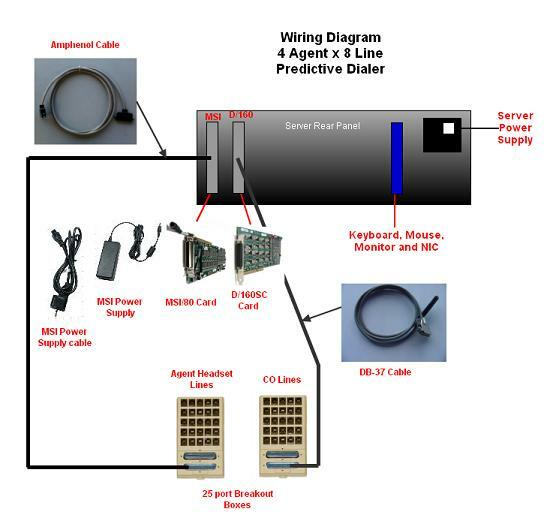 These two large, grey cables connect between the Dialogic cards in the back of the Server to the two breakout boxes. The amphenol cable is for the MSI/80 card and has black connectors on either end. The DB-37 cable is for the D/160 card and has a black connector on one and a silver connector on the other. These boxes receive the cables from the Dialogic cards. Each box has twenty-five RJ-11 jacks. In the configuration above, only the first 4 ports are used for the MSI card and the first 8 for the D/160 card. MSI Power Supply and Cable: This external power supply is what provides power or Talk-Battery to the headset/amplifiers at the stations. This must be connected for the Agents to get sound in their headsets.